This is also our entry into today's Saturday PhotoHunt: "Play"
well, at least we think it's a toy. It sure kept Maxwell occupied, trying to figure out how it worked! Allie: Does this Top make me look fat? Look at how great CJ's looking! 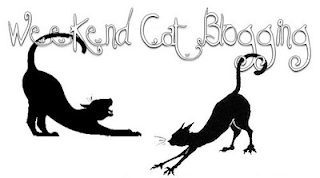 We're participating in the Weekend Cat Blog! I think it is so funny when humans try to make us kitties play with toys that aren't really meant for us! CJ is looking pretty happy these days! CJ... you're looking wonderful. Yeah!!! 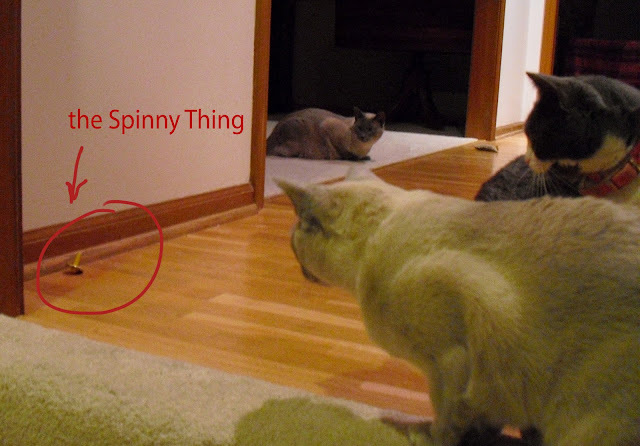 Now, regarding this strange spinny thing... have you figured out yet what it is and how it works? Maxwell: we has NO idea...we're open to suggestions! FaRAdaY: I canz tell you unequivocally, though, that it is NOT nommy! Vincent and Jules would bat that under the sofa in half a second - again and again and again - helping me get exercise, too. Spinny things make the best toys! Yous guys has a great toy! Wowwie! That little spinny thing looks like FUN! Faraday: * intrigued look* oooooh..... HEY MOMMY! BRING THAT THING BACK! What a great idea. I'm going to try it. Hey it's Jet here. You guys are just like my feline brothers, Puffy and Fluffy... They can entertain themselves with Mom's pen! Have fun pondering the spiny thing. 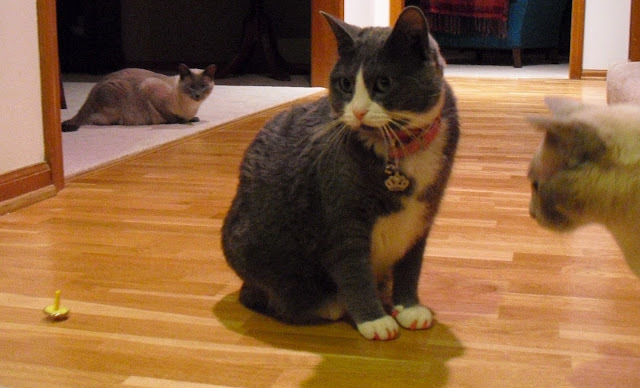 Allie, it certainly doesn't make you look fat. Allie: oh girlfriend, thank you! *huge sigh of relief*! Looks like you guys really liked that. Was that some kind of drawer pull? Maxwell: Papa sez it was part of a physics toy that demonstrates magnetism. Faraday: yeah, yeah, blah, blah. It was *not* nommy, that's all that matters! 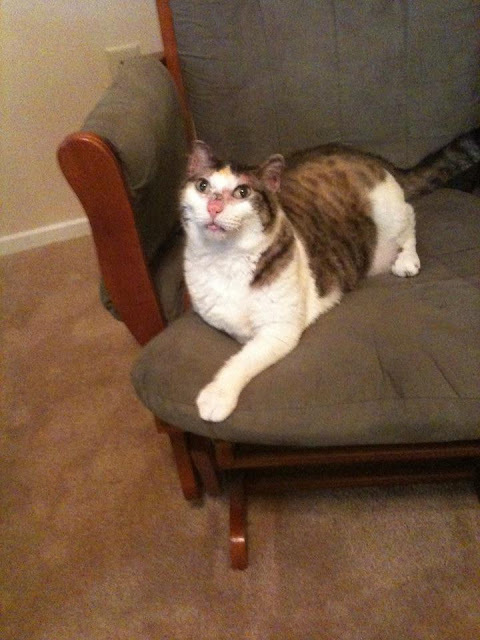 Was it nommy? It doesn't look furry tasty to me. But it does move around by itself and things that do that usually taste pretty good, so maybe. Allie, You are stunning! Could I teleport over for a little cuddle sometime? CJ: Looking good, man! I gotta do some finking about what CJ stands for though. Happy St. Paddy's Day kitties! That toy does look kind of interesting...got a chuckle out of the video! CJ is looking great, what a sweetie he is, we caught up on all your posts and we are so happy to see updates and pictures on him. Continued purrs to him from us.